Somewhere, I suspect, an illusionist is adapting the common woodchipper to stage magic. I’m not sure I want to know how that’s going to work. Imitation is said to be the greatest form of flattery but for one Melbourne driver, taking to the streets of Albert Park has turned into a great form of foolery. Just 10 minutes after purchasing a 2013 Porsche SUV, a 37-year-old Yallambie man was pulled over after allegedly being clocked at more than 60km/h over the speed limit and had his new car impounded. The enthusiastic driver filmed himself on a mobile phone while travelling at more than double the speed limit along Aughtie Drive, part of Melbourne’s Grand Prix Circuit. I’m guessing he thought the police never, ever look at social media. But they didn’t have to, since they caught him in person. 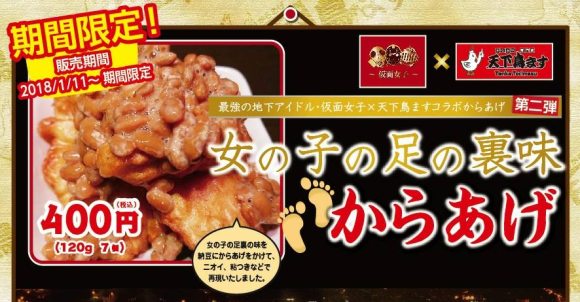 At first glance, the menu at Japanese takeout chain Tenka Torimasu looks incredibly simple. They serve karaage (Japanese-style fried chicken), karaage bento boxed lunches with rice, cabbage, and potato salad, and that’s all. But there’s a hidden depth of variety at Tenka Torimasu, because of how many different flavors of fried chicken they offer. Want teriyaki fried chicken? No problem. Neither are curry, wasabi, sweet chili, ponzu, or plum. And as this month, you can also try girls’ sole flavor. Definitely don’t get the extra crispy. Wonder what he might have thought of this? And I’ve gotten raspier over the years. Wonder what’s going to happen to this young lady? I mean, God forbid she should end up sounding like me. “The Sun Ain’t Gonna Shine Anymore,” recorded at a Four Seasons session in 1965, was intended as a Frankie Valli solo release. It didn’t go anywhere, but the Walker Brothers, a British Invasion group who were not from Britain, not brothers, and not named Walker, topped the British charts the next year with a splendidly-overproduced cover. Last week, we got to hear the song in a suitably bleak arrangement, courtesy of Saddest Clown Ever Puddles Pity Party.